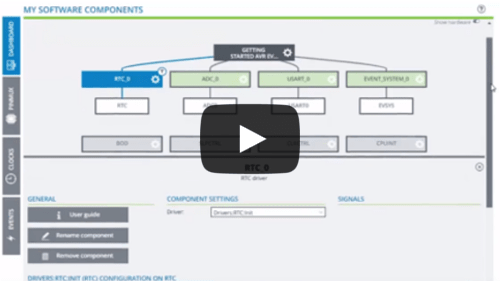 This tool will help you select and configure software components and tailor your embedded application in a usable and optimized manner. To get started you can either create a new project from scratch or open an existing example. In both cases you can configure your software components and device settings such as clocks and pin layout. When you are done, you can export your project and open it using your favourite IDE for further development. For more information on how to use Atmel START, read the Getting Started guide or watch our video tutorials . Use this option if you want to restore a locally saved project. Browse and select either a project file (*.atzip) or a configuration file (*.atstart,*.json). Your latest project will always be stored in your web browser. Use this option to pick up where you left off.